*In 2013, the biomethane research indicated in 1 has been given a higher priority, meaning that an immediate freeze was placed on the research in 2. Plans are to resume this research as future circumstances allow. H-RISE will advance research on the dissolution characteristics of CO2 microbubbles, the chemical composition of groundwater and special characteristics of groundwater flow over broad areas, effective use of subsurface microorganisms, and the mechanical characteristics of bedrock obtained from the JAEA’s Underground Research Laboratory (URL) and similar facilities, while maximizing the utilization of research results to fulfill important research objectives. As the only research center in Japan to target sedimentary rock, the JAEA’s Horonobe URL is an invaluable facility for collecting samples and performing in situ testing. H-RISE plans to continue utilizing this facility, based on the mutual relationship that has been built over the years through collaborative research. According to estimates provided in a survey of the Hokkaido prefectural government, there are approximately 20 billion tons of lignite in the Tempoku area. Because of the high profitability of recovering this resource without development of a coal mine, converting this low-grade lignite to biomethane via microorganisms would allow exploitation of an underused resource. Groundwater in diatomaceous formation around Horonobe area is saturated with methane gas with maximum dissolution limits. Profitability can be enhanced by collecting biomethane generated in situ by the use of microorganisms, as well as the methane gas originally present in the groundwater. 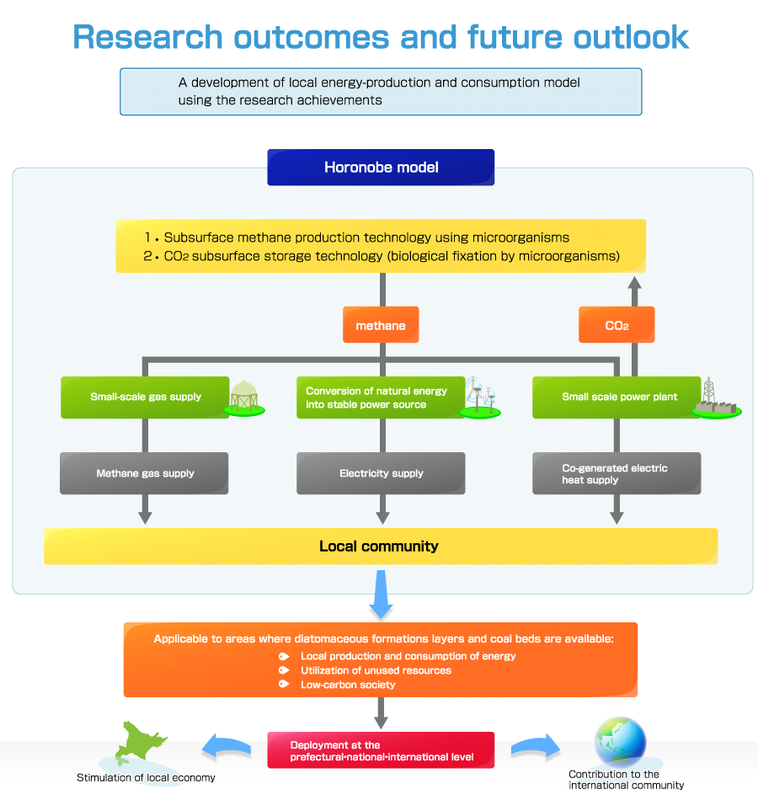 H-RISE carries out flexible and multidisciplinary research though collaboration with research bodies such as the Underground Research Center of JAEA and the National Institute of Advanced Industrial Science and Technology (AIST), which has a proven track record in microbial research, as well as Hokkaido University, Hiroshima University, and other institutes of higher learning. 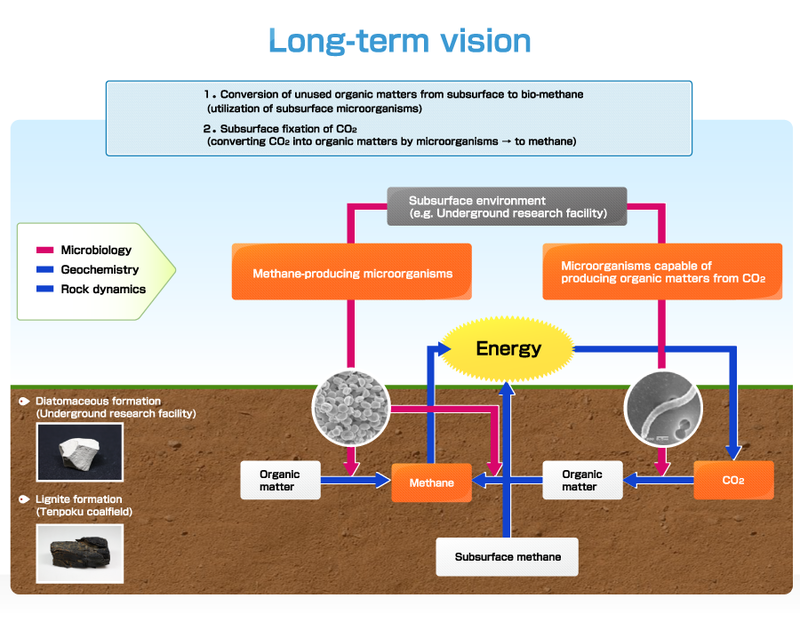 By establishing technology to convert organic matter in geological layers into biomethane using microorganisms, new domestic energy sources can be created and, through the development of methods for Carbon Dioxide Capture and Storage (CCS), reductions in greenhouse gases may be realized. Utilizing locally produced biomethane may also promote the local consumption of regional energy, leading to regional development. Usage of the produced methane gas for small-scale thermal power generation is anticipated to provide a new stable power source for the northern Hokkaido region, and will serve as a backup to natural energy sources such as wind power and mega-solar (about 180,000 kW). 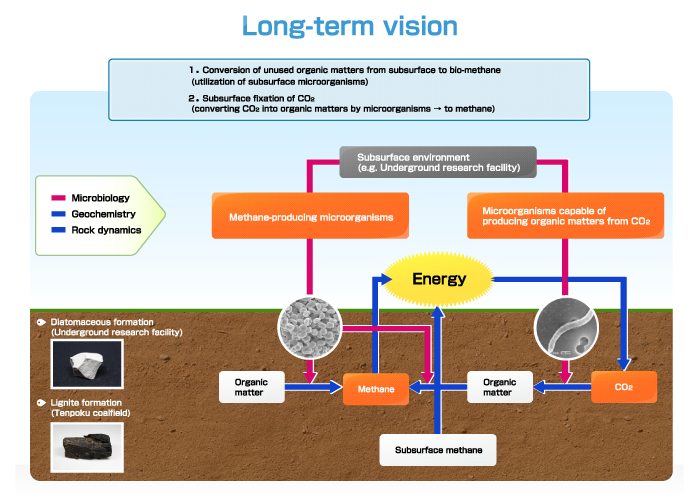 By combining biomethane generation technology with CCS, H-RISE can provide a non-CO2-emitting energy production system to regions in Japan and overseas that possess both lignite formations and sedimentary rocks. 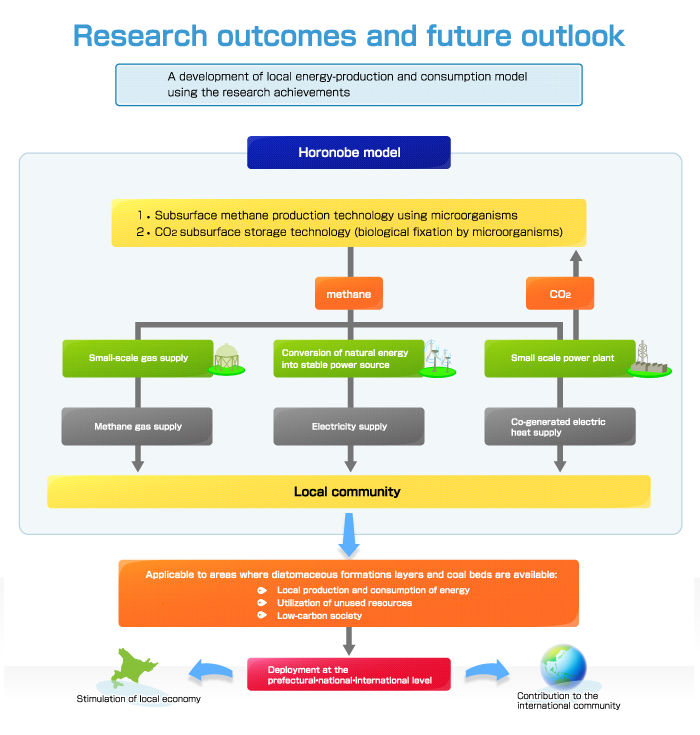 This model of local energy production for local consumption, made possible by small-scale distributed thermal power generation, has great potential for deployment to all of Hokkaido and the rest of Japan, and perhaps globally as well.